There are many reasons to love North Beach, and our amazing small businesses are front and center. Some of North Beach’s greatest landmarks are small businesses - such as City Lights Bookstore (an icon of the beatnik movement), The Saloon (one of the oldest bars in San Francisco), or Liguria Bakery (a family business for over 100 years), amongst many, many others. However, in recent years the health of our small businesses has taken a rather dramatic negative turn. As both long-term and newer businesses have continued to disappear, residents have rightfully spoken up about the impact empty storefronts and restaurants are having on the community and local tourism. 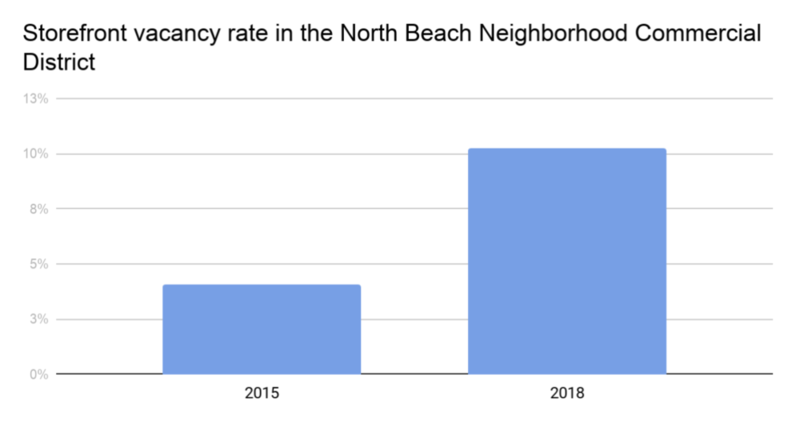 According to The 2018 Vacancy Study conducted by North Beach Neighbors in conjunction with North Beach Business Association and Telegraph Hill Dwellers, commercial vacancies in the North Beach Neighborhood Commercial District has more than doubled over the past two years. The trend in North Beach is consistent with nationwide and city-wide trends. In 2017, nationwide retail unit closings more than quadrupled from 2,056 to 8,640 as more of us shop online. Across San Francisco, according to OEWD, sales tax revenue from Restaurants and Hotels has been steadily increasing since 2009, while General Consumer Goods revenues have been steadily declining since 2014. We asked the city to prepare sales tax revenue data for the North Beach Neighborhood Commercial District and the trend in our neighborhood mirrors that of the city at-large as seen below. This trend in sales data helps us understand the fact that only 21% of our vacancies are zoned for restaurant usage, and the vast majority are zoned for other retail. To look beyond the data, we spoke with small business owners (current ones and new ones), interviewed landlords, asked residents what they wanted to see come to the neighborhood, and examined the Planning Code. Through that exercise, another root cause emerged: North Beach puts more restrictions on its small businesses than any other neighborhood in the city. This manifests in the types of businesses we allow, what we allow those businesses to serve, and how many approval steps a new business has to go through before opening. Based on our extensive investigation into the issue of commercial vacancies in our neighborhood, we have identified a path that we believe will restore North Beach to the home of thriving small businesses as we all remember it to be. Section 780.3 of the Planning Code defining the North Beach Special Use District specifically aims to allocate more space for retail and services businesses, and limit the number of places for food and drink. This preference may have made sense in the past; however, it doesn’t reflect the current nature of shopping, which has steadily and dramatically shifted online. The current Planning Code (sections 186.1d and 178d) makes it just about impossible to open a restaurant in a space that was not very recently a restaurant or bar. Specifically, North Beach is one of only four neighborhoods that limits the period that a former restaurant space can be reopened as a new restaurant to 18 months without going through a new approval process. After this 18 months has passed there is no clear process by which that space can revert to being a restaurant. To acknowledge the new reality of the way we shop, these sections should be modified to allow Restaurants and Limited Restaurants in more spaces, regardless of their historic or recent use. Serving beer and wine is important to both the dining experience of visitors to a restaurant as well as the businesses serving that beer and wine. In particular, beer and wine represent one of the highest margin items on a restaurant’s menu and therefore serves an important profit generator. Can you imagine going to Italy and not having a glass of wine with your meal? Well, in our Little Italy in many cases we withhold this experience from you. This is another area of the Planning Code where North Beach has special, more restrictive, treatment. 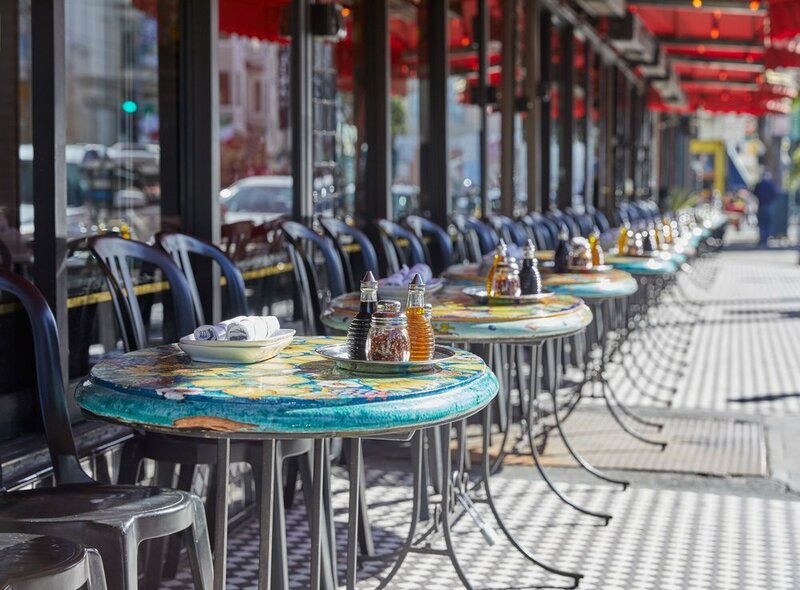 In San Francisco, only full restaurants are allowed to serve beer and wine with their meals; however most of our smaller restaurants are defined as Limited Restaurants, and are therefore not allowed to serve beer and wine. Unfortunately, the North Beach Special Use District doesn’t allow Limited Restaurants to be rezoned as full Restaurants. We have heard of several business complain about their inability to obtain serve beer and wine with their meals, and at least one - Dip (at 1318 Grant Ave) - cited its inability to get a beer and wine license as its reason for closing. A mixed-use business is a business with more than one type of operation in the same space - for example a bookstore that also serves coffee, or a laundromat that includes a bakery. 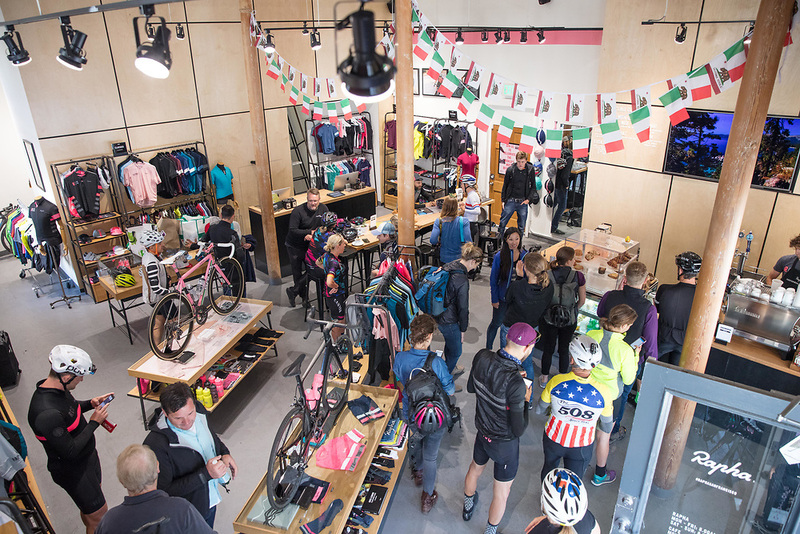 Allowing mixed-uses have at least two potential benefits: first, it gives a small business an additional potential revenue stream, and second, in a retail environment, it gives a shopper a reason to linger and increase their likelihood of buying something. In December 2018 the Board of Supervisors passed a set of Planning Code changes entitled "Planning Code - Temporary Pop-Up Retail, Flexible Retail, and Arts Activities Uses" which allows for retail spaces to have multiple uses, and in fact potentially allow multiple business owners to use the same space. However that legislation only applies to Districts 1, 4, 5, 10, and 11 and we believe it should be extended to include District 3. One item with recent attention, that we remain very cautious on, is a vacancy tax on commercial landlords with vacant storefronts. We understand and appreciate the intention: there are indeed landlords who are not actively marketing their properties, and that affects everyone in the neighborhood. However, of the two landlords whose properties represent the greatest share of vacancies (at 21%), only half of those locations have been vacant for three years or more. This means a “vacancy tax” may only really help with 10% of the problem. Moreover, we’ve spoken with brokers and landlords with vacancies who have been desperately trying to lease their properties, and have been unable to, due to peculiarities of the planning code in our neighborhood. These landlords would potentially face a crippling tax despite their best efforts to be good neighbors. In sum, our belief is that we should be first focusing on improving the environment for small businesses in our neighborhood before imposing punitive measures. An inviting street environment invites visitors to visit our neighborhood and invites them to linger. Hayes Valley and The Mission stand out as neighborhoods that have used green spaces, street art, and innovative business settings to draw visitors from all across the city. This recommendation has particular urgency given the upcoming Washington Square Park closure. We should note that all of these recommendations can be quickly-implemented and have the intention of remedying our currency vacancy crisis as quickly as possible. In particular, recommendations #1 and #2 require changing only a few paragraphs of the Planning Code, and recommendation #3 can be implemented by extending existing legislation to District 3. Preservation programs like The Mills Act and The Legacy Business Program are good steps to give relatively small subsidies to a small set of qualifying businesses. However we believe we need to go beyond and remove the controls that limit business success, and which will support both new businesses as well as our established businesses. We need to remember that our legacy businesses now were once new businesses themselves. Would these same business we love have been able to start in today’s climate? We do also welcome the opportunity to think further ahead and imagine what our ideal commercial corridors would look like. Should we be continuing to require ground floor space in new developments to be zoned for retail? Would this simply add to the vacancy problem, and could that space be better used by other community-serving establishments (daycare, community centers, co-working spaces, etc.)? What is the right balance of transportation infrastructure (roads, sidewalks, bike lanes, public transit) to support the preferred modes of transportation of visitors to our neighborhood? And how can we better communicate the availability of parking to visitors from other parts of the city? Knowing that car usage is on the decline (particularly amongst younger people), and pedestrian-friendly streets generally increase business sales, can we begin to experiment with street closures that serve our neighborhood? Would the creation of a Community Benefit District in North Beach be a better way to ensure our small businesses are adequately supported and are working together to improve the health of small business? North Beach is the quaint, inviting, and fun neighborhood that we all love because of the generations of concerned citizens who came before us and helped shape our neighborhood’s character. Our recommendations above acknowledge those efforts and simply aim to correct course as the commercial environment around us changes. We’re ever hopeful that by working together our ‘vibrant village’ can shine even brighter. 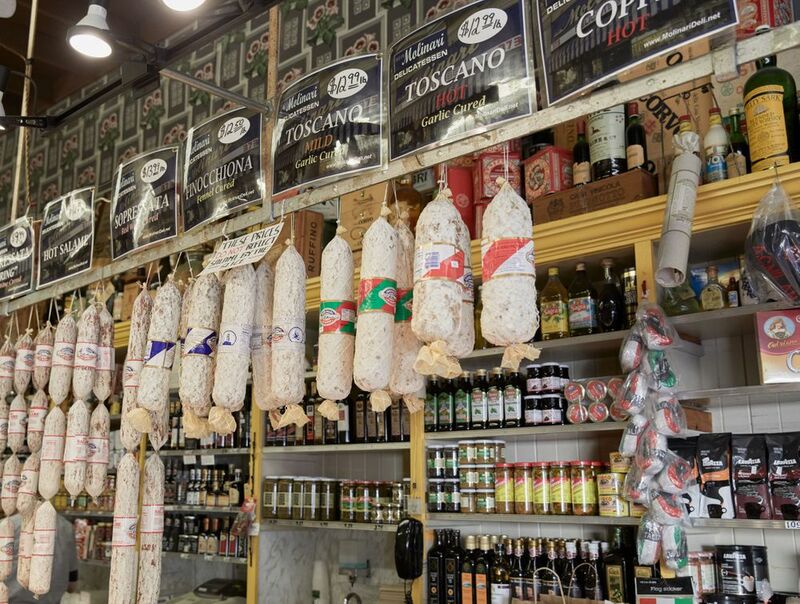 Join North Beach Neighbors and our 300+ business and resident members to help support our recommendations to ensure a strong business community in North Beach.